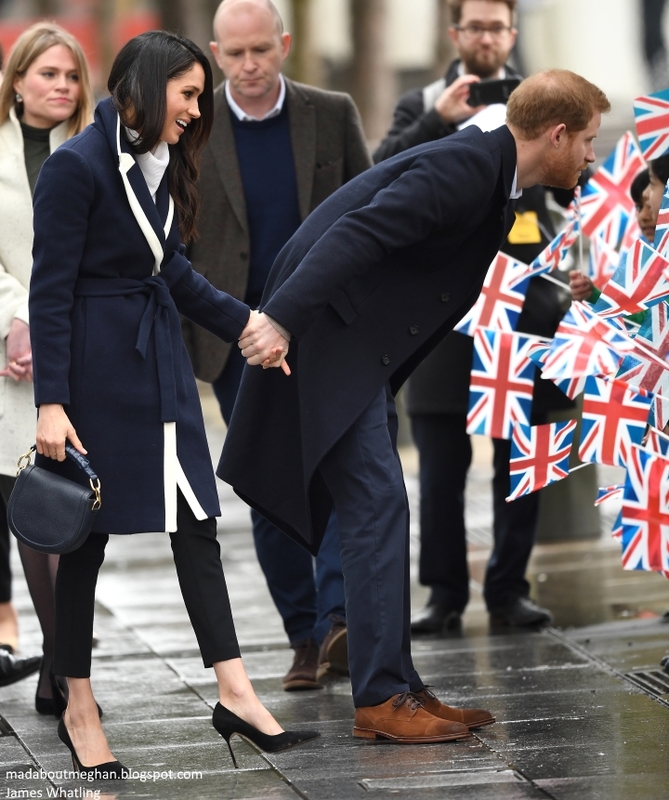 Mad About Meghan: Harry and Meghan Mark International Women's Day in Birmingham! 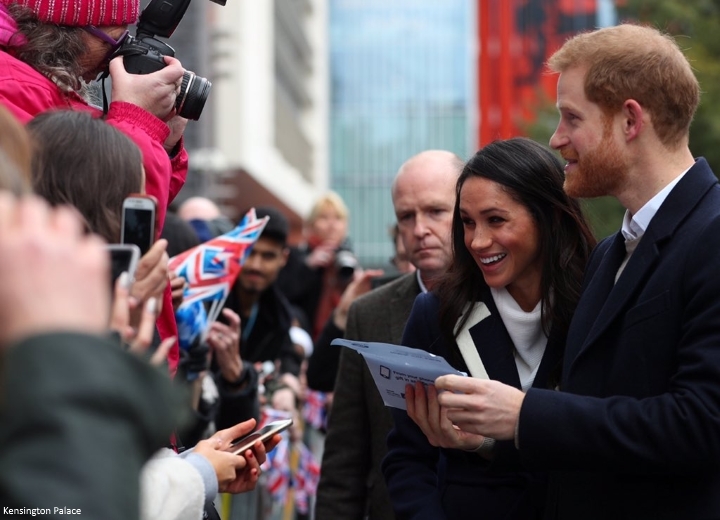 Harry and Meghan Mark International Women's Day in Birmingham! On International Women's Day, Prince Harry and Meghan Markle visited Birmingham to learn more about two projects supporting women and young people. It's been an eventful week for Meghan thus far; over the weekend she enjoyed a bridal shower at Soho House in Oxfordshire, complete with a spa, cinema and tennis courts. Meghan's actual 'hen party' is still to come though. On Tuesday evening, Meghan was reportedly joined by Harry, Prince Charles and the Duchess of Cornwall at the Chapel Royal at St James's Palace where she was baptised by the Archbishop of Canterbury. The service observed the full ritual of the Church with holy water from the River Jordan from the private Royal Family font poured on Miss Markle’s head. The baptism was followed immediately by her confirmation, which means she will be able to join Harry at Holy Communion. Meghan had two supporters, the equivalent of godparents. 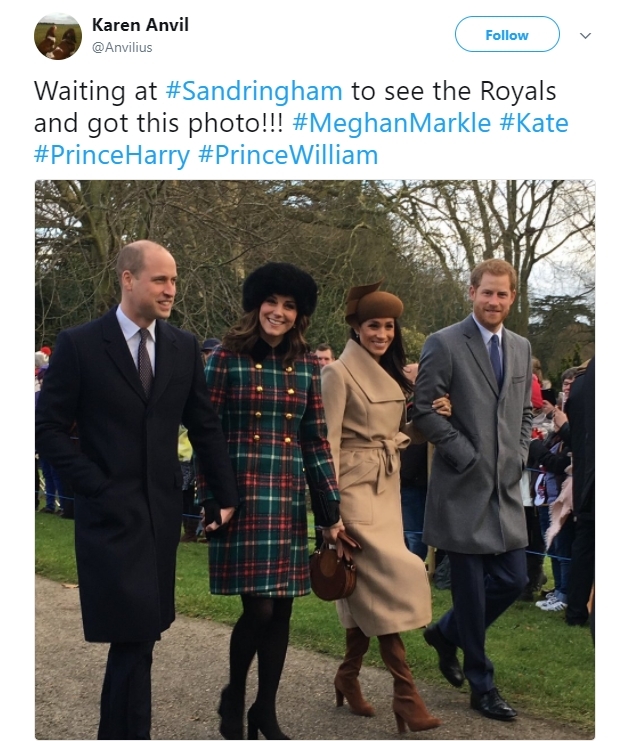 It is thought one was close friend and stylist Jessica Mulroney who revealed she's been in London this week on social media. 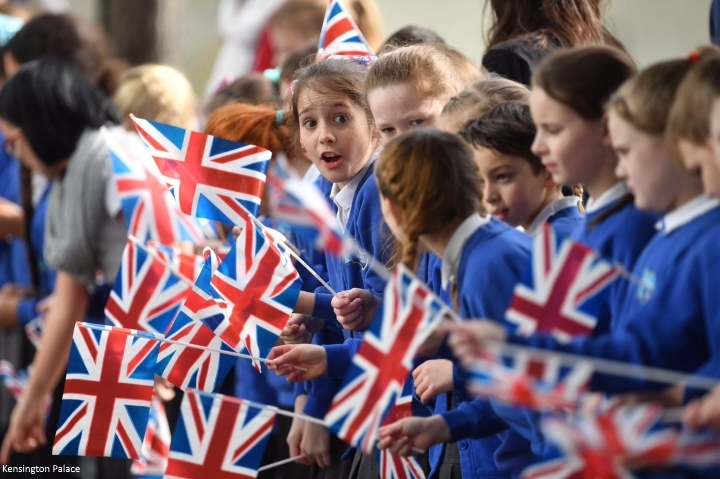 Richard Kay reports "it is not thought Miss Markle’s mother, Doria Ragland, or her father, Thomas Markle, travelled from the US for the service." The Duke and Duchess of Cambridge were also not in attendance. It is understood the 18 guests walked to Clarence House afterwards, where Charles and Camilla hosted a dinner. As with the majority of Harry and Meghan's pre-wedding visits, the day kicked off with a walkabout. Their tour of engagements around the UK are very much focused on meeting as many people as they can. A video from Victoria Murphy. Schoolchildren waiting to meet the couple. 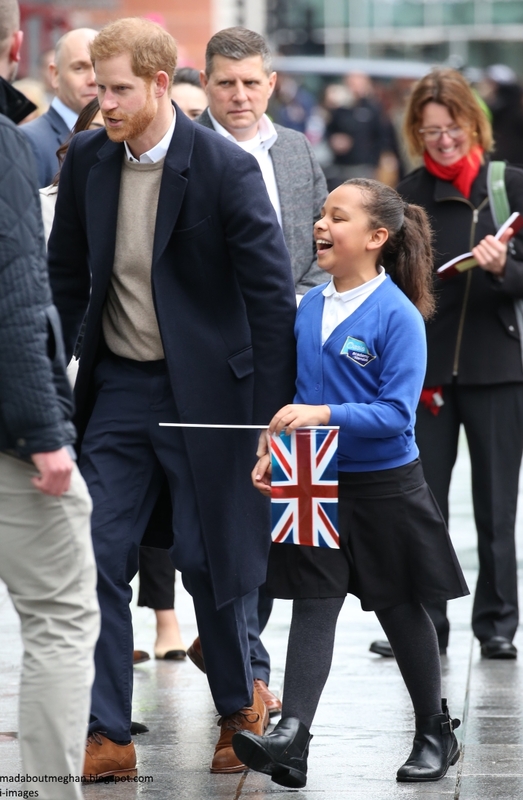 Prince Harry met ten-year-old Sophia Richards and asked her what she wants to be when she grows up. When she replied 'an actress' he took her by the hand over to Meghan. Before she returned to her classmates, Meghan gave her a hug. A very sweet moment! Meghan enjoyed chatting and joked that after living in Canada the weather in London doesn't seem bad at all. 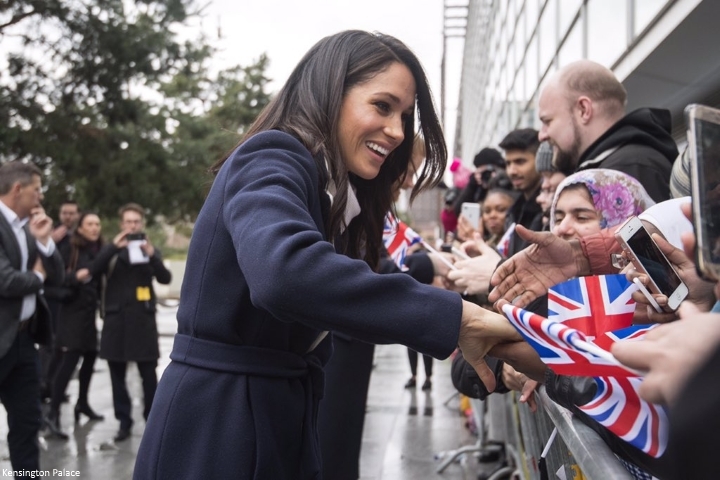 Meghan noted she was delighted to visit Birmingham on International Women's Day. A video from Jack Royston. A very nice video with several moments from the walkabout. 'Two elderly sisters, Irene Gould, 82, and her younger sibling June Dickinson, 78, were also ecstatic after meeting Harry and his fiancee. 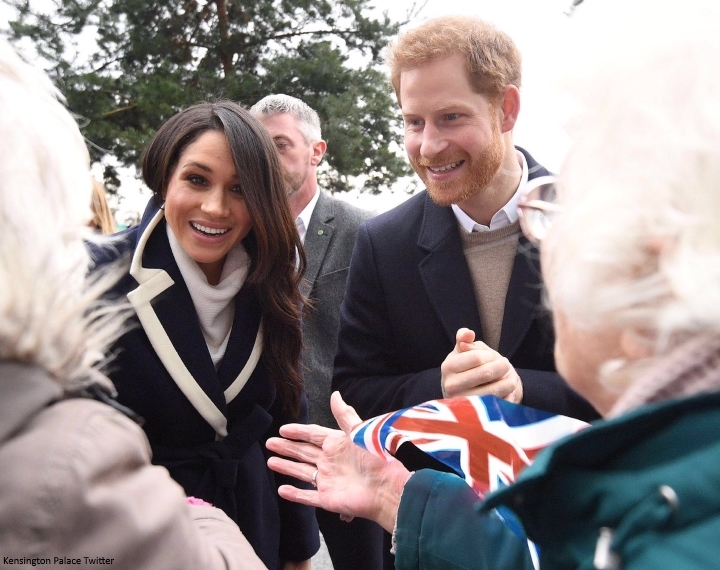 Mrs Gould said: "We were just so pleased to meet them, and how beautiful Meghan is. We thanked Harry for coming to see us and wished them all the best for their marriage." Student Charlotte Highsmith, from Oxford, was overcome with excitement after meeting Meghan and said: "Oh my God, it was worth the wait - I've missed my lecture." The 20-year-old, who is studying criminology and policing at Birmingham City University, added: "Meghan just thanked us for waiting in the rain for her, but it wasn't a problem." Harry also caught up with Karen Anvil, a royalist who took an outstanding photo of the 'Fab Four on Christmas Day which made the cover of newspapers and magazines all over the world. Harry told Karen he "hoped she made lots of money from it". It seem very fitting for Meghan to make an appearance on International Women's Day. She has been passionate about supporting women throughout her life. In 2015, to mark the day, she gave an inspiring speech on gender equality. Last year, she wrote a powerful essay for Time: How Periods Affect Potential to discuss an often forgotten issue on Women's Day. It is thought women's issues will be an important focus of her royal work in the years ahead. 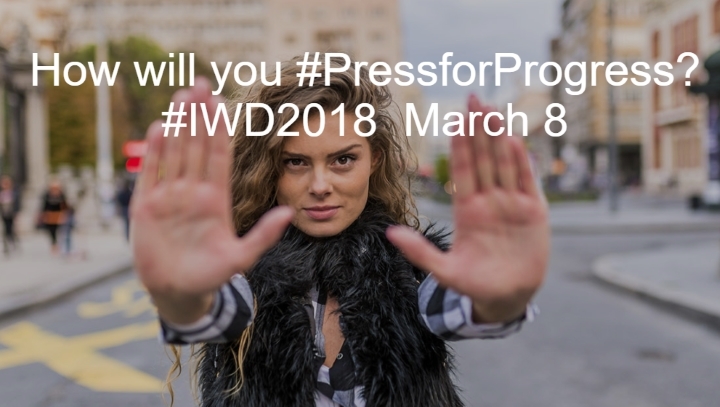 This year's campaign theme is #PressforProgress. 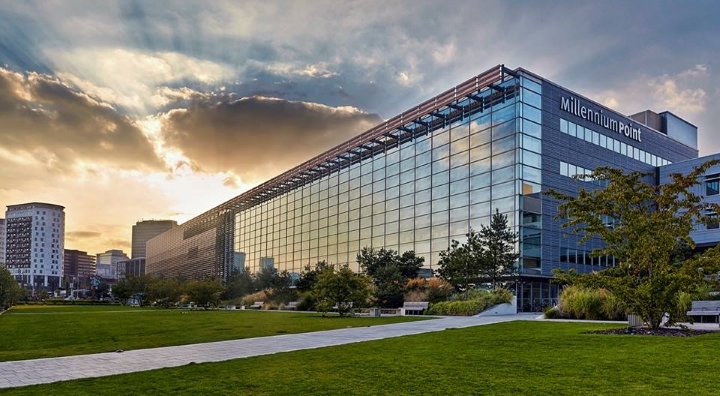 At Millenium Point, they attended an event which aims to inspire the next generation of young women to pursue careers in Science, Technology, Engineering and Maths (STEM). Hosted by social enterprise Stemettes, the event brought together female students from local secondary schools. The event included interactive activities, a panel discussion, speed networking opportunities with local businesses, and information on work experience, apprenticeships, A-level choices, and university degrees in STEM. 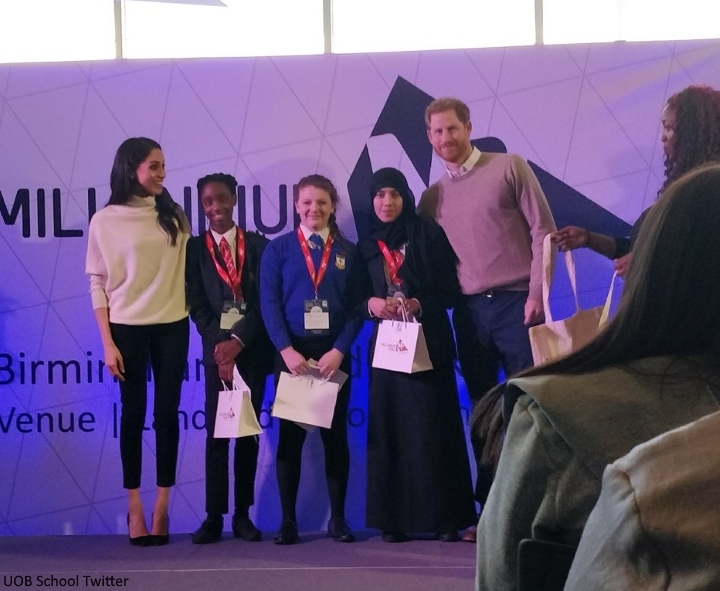 Prince Harry and Ms. Markle joined the young women as they participated in building apps and touchpads. They heard more about their motivations to pursue STEM subjects. A video from the chat. "All girls will be able to make informed decisions about careers in Science, Technology, Engineering and Maths (STEM), so that eventually women can be proportionally represented in the field. So that we can have 30%+ of the UK's STEM workforce being female, as opposed to just 21%.". 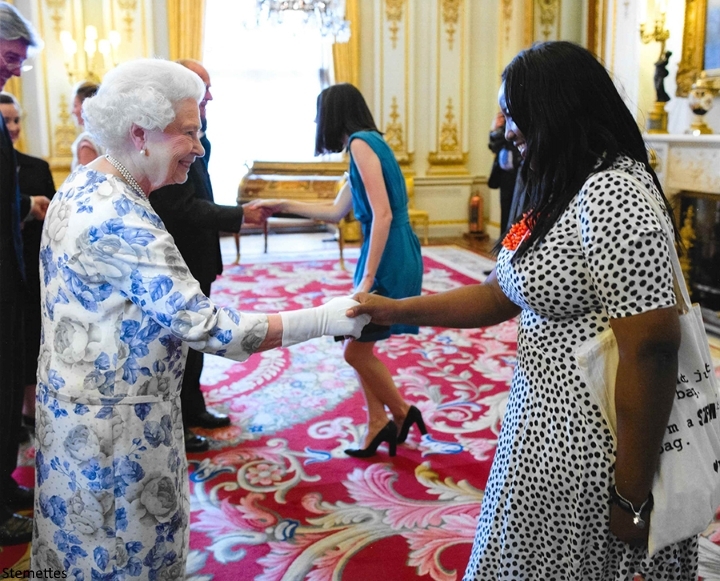 Co-Founder and CEO Anne-Marie Imafidon was honoured with an MBE from Her Majesty in 2016 for her services to young women within STEM careers. 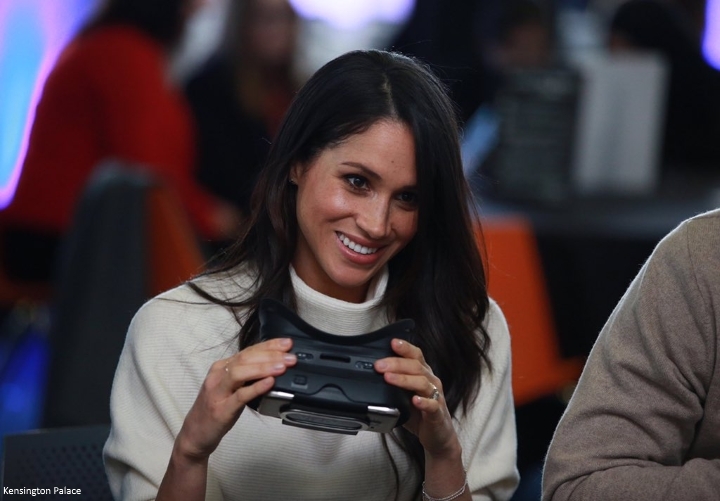 Hannah Furness reports 'Meghan Markle particularly keen to hear about Hack The Web, programme that lets girls 'edit' websites. "So you can change something untrue into something positive?" she asked. "That's so cool!" 'Prince Harry told pupils: 'You must have brains the size of a planet. And you can't just come in today, do this and leave. You've got to carry it on.' Watching girls placing wires from a laptop computer to a bananas, to connect it to make it work as digital bongos, he told his fiancée: 'I was going to try and help but...' before laughing and showing her the instructions. 'Oh wow,' said Meghan. Dr Anne-Marie Imafidon said seeing the couple embrace Stem subjects would make a significant difference to how science, technology, engineering and maths are perceived. The couple posed for photos with young scientists. 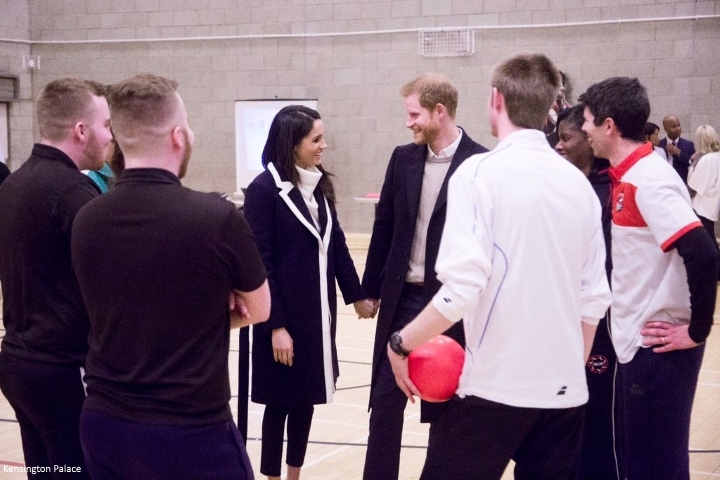 Next, Harry and Meghan visited Nechells Wellbeing Centre to join Birmingham's Coach Core apprentices as they took part in a training masterclass led by Create Development. 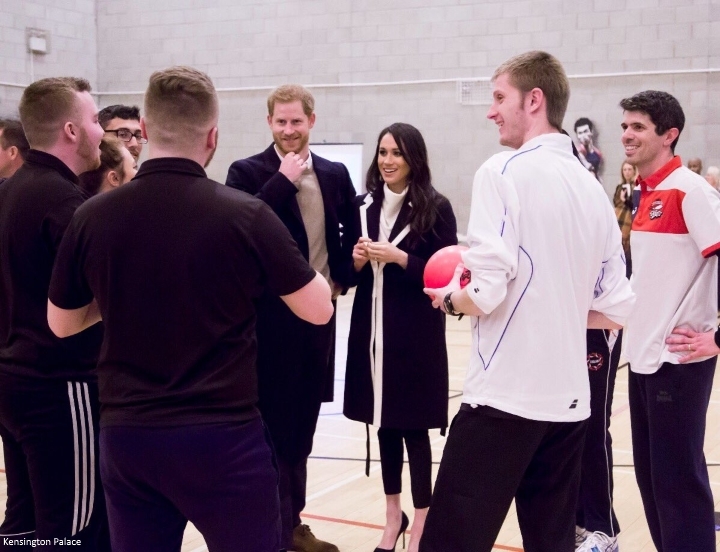 The Coach Core apprenticeship scheme was designed by The Royal Foundation of The Duke and Duchess of Cambridge and Prince Harry to train young people aged 16 - 24 with limited opportunities to become sports coaches and mentors within their communities. During the year-long apprenticeship, which now operates in ten cities across the UK, the apprentices learn technical sport skills alongside an inclusive and holistic approach to coaching, with an emphasis on employability and mentoring skills. 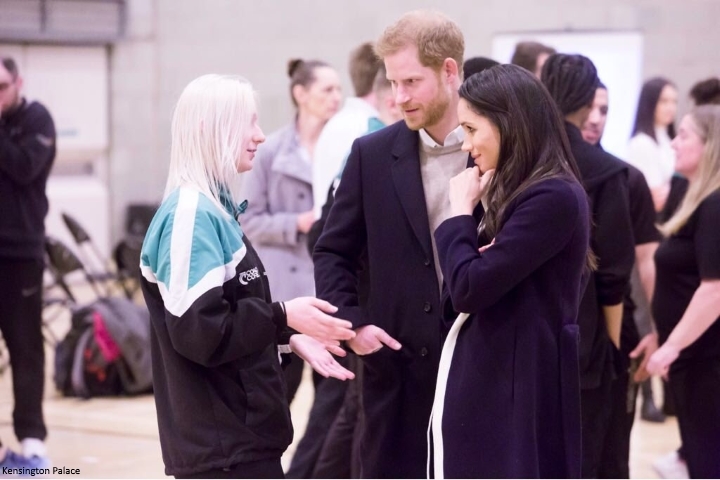 Prince Harry and Ms. Markle chatted to the apprentices about their experiences of the programme – which launched in Birmingham in March 2017 – before joining them in the sports hall as they deliver practice training sessions. KP posted this image on their Twitter account. I loved Meghan's relaxed but professional look today. The styling of the individual pieces and the tailored fit of the trousers made this my favourite ensemble since the engagement announcement. Meghan looked chic in the £330 J Crew Two-Tone Wool-Blend Coat. The white and navy coat features a slightly loose shape which makes it easy to layer over shirts and knits, while the contrasting white edges nod to the brand's signature stripes. It's available in very limited sizing at Zalando, Net-A-Porter. You can also view on the J Crew website. 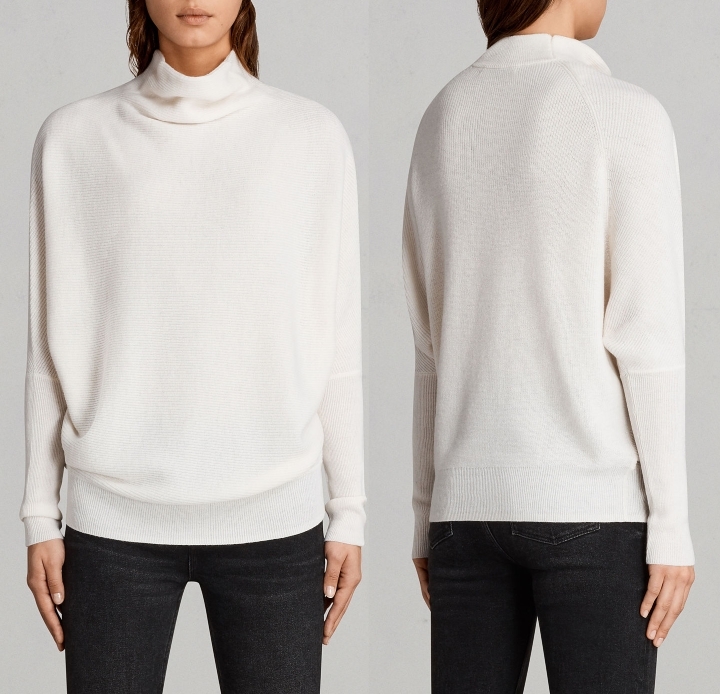 Giulia identified Meghan's sweater as the ALLSAINTS Ridley style. The £168 'chalk white' garment is made from a wool and cashmere blend. It features a slouch funnel neckline to contrast with fitted sleeves. It's available on the ALLSAINTS website, in black and navy at John Lewis and House of Fraser. 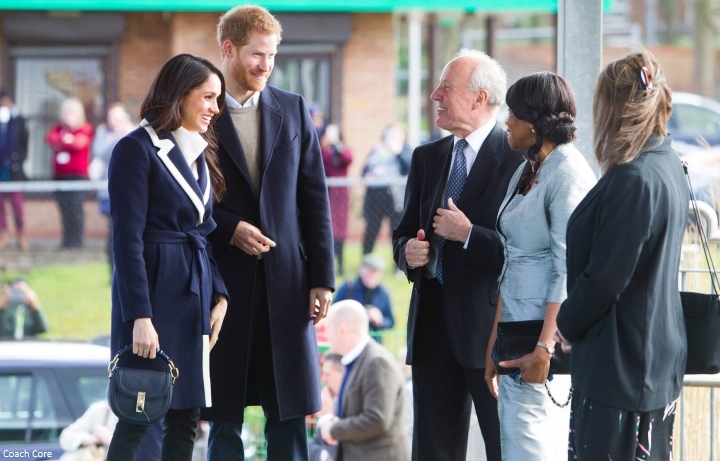 Meghan's carrying the Altuzarra Ghianda Saddle Bag (with thanks to Perths Fashion). 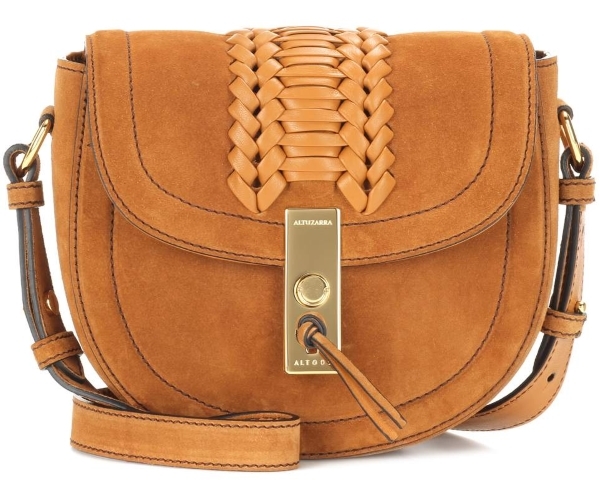 It's available in black at Matches Fashion discounted to $957. In fact, she loves it so much she has two. Meghan was spotted carrying the tan version last year. It's discounted by 40% at My Theresa. 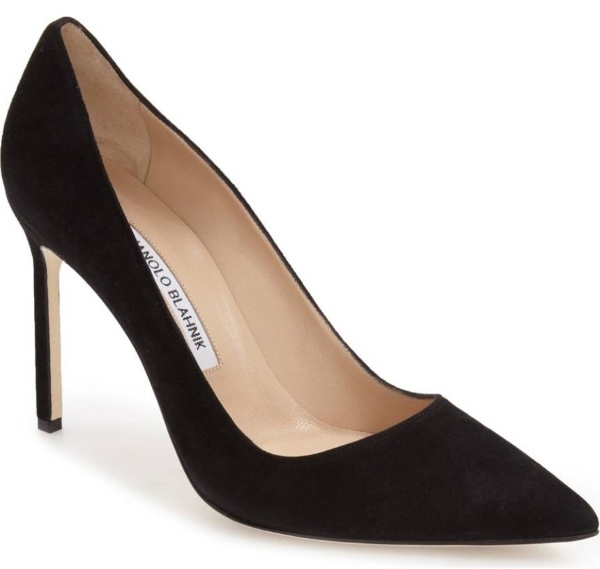 Meghan wore her Manolo Blahnik BB pumps. Meghan's trousers are by Alexander Wang. Meghan accessorised with a new silver bracelet by Birks. It is thought it may be have been a gift to celebrate her baptism. Happy International Women's Day to you all! We'll see Meghan and Harry on Monday afternoon for the Commonwealth Day service. I agree! That coat is gorgeous. I envy the way she pulls together such polished outfits with neutral colors. They seem so happy and confident. It really is fun to follow along. I agree. It’s her own style: simple, mature, elegant. Yes! That's an excellent silouette for her. I like it! 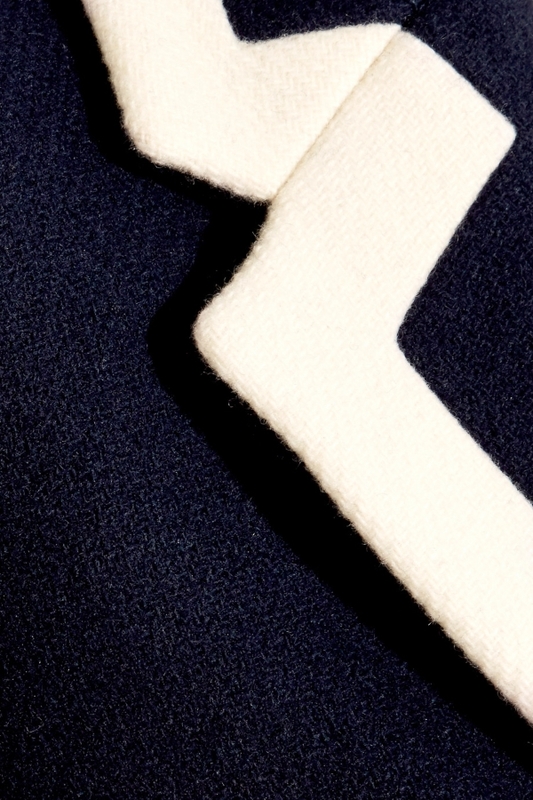 Now a little more color but black and blue and white and everything is perfect. Yes! I agree she looks great today. Totally sophisticated and professional look from head to toe. So far this is an extremely polished and elegant look, and I am really glad they are marking International Women's Day. She looks great from the knees up. It’s a welcome change that the coat isn’t black or a plain neutral, and it fits her nicely. The white sweater looks great underneath. But the pants and shoes just look like something she threw on at the last minute without thinking about where she was going. A glance in a full length mirror would say to me that either the pants or shoes or both need to be substituted. A slightly longer pant and high heeled ankle boot would be a big improvement. Imho these heels are perfectly combined with this pants. But I agree ankle boots would work well too. Barbara, those are my exact thoughts too! From the knees up this outfit is terrific - as Bertie said above, it's her most royal coat yet and I love the white jumper - yay! If only the trousers had been navy instead of black and she'd worn a different pair of shoes, this would have been perfect. I'm so glad to see that navy seems to be creeping in to her wardrobe a bit more lately, at the expense of some of the black. I really hope this represents a step towards something a little brighter and more varied for the future. Happy International Women's Day to everyone on the blog! I don't see the pants/shoes issue here. It seems fitting and fashionable to me. If she wore ankle boots the complain would have been that its too bulky. Agree completely. This is the current look for ladies on trend. She carries off the look to complete perfection. Meghan looks like she just stepped out of Vogue. Additionally, the JCrew coat is so reasonable and affordable for many to replicate. Barbara - when she wore ankle boots and slightly cropped pants the other month (in Scotland I believe), everyone complained that she should be wearing heels! It seems like the criticism of Meghan is unending. It's exhausting to watch, I can't imagine how Meghan must feel. For me, it isn't a criticism of Meghan, it is a dislike of the cropped pants style in general. As someone who is tall, I grew up finding it hard to find pants that were long enough, so the "high-water britches" look has always made me cringe. There is no argument from me that she is a beautiful, stylish woman, I would just prefer a longer pant. Love the shoes, but my feet hurt just thinking about wearing them! I don't know how she and Kate do it on the walkabouts! I liked Meghan's look, but I too agree that her pants were too short. I also thought that about the pants she wore to the Endeavour Awards ceremony. But, I hope Meghan keeps rocking the pants! I just have two words for her, Queen Letizia! Queen Letitia recently wore the same cropped trousers and high heels. It’s not a style every woman can wear, but they both look great. Loving the look so far!! With the tiny exception of the scuffed suede shoes. It was always a pet peeve of mine when Kate wore/wears scuffed up, old-looking suede shoes and I feel the same here. There must be a way to keep them more clean looking. Other than the shoes though she looks lovely and quite polished as someone above said. I love that coat and the sweater too from the shopping link Charlotte provided. I do wish her hair were pulled back so it won’t fall in her face and she won’t need to adjust it so often (another pet peeve with Kate and now Meghan too). Can’t wait to see her whole indoor outfit and to see them interacting and engaging with folks during the day. Yay!! Also how funny but Harry was a total afterthought for me lol. Poor royal men (well, not really since they’re usually the ones with the power, but sartorially, no one much cares)! I totally agree Meghan must change her hairstyle because now she needs to adjust her hair every 10 seconds! This is the only think I dont like about her styling. I agree about her hair, it’s become a BIG distraction. The layer that falls forward needs a pin, or she should grow it longer. She is fabulous with people! I would wear something similar to this outfit myself in the winter, but not if I had to be seen and photographed at a public event. It seems too American style casual. I’d like to see her more polished and dressy. This can be achieved with nicer trousers and fancier tops, which many of us wear to work. I love this outfit. She looks very polished and is going to give the dress wearers a run for their money. I totally agree about her hair. Keep it out of your face, period! She needs to do something about that. It's distracting. Happy Women's Day to Meghan, Harry and all women around the world! Meghan looks beautiful as always. Keep smiling and shining Meghan! Happy International Women's Day to you as well, all my fellow women on MadAboutMeghan, and around the world!! I find her coats to look bulky and heaviness to her and this one is no different. This look is all over the place. The pants seem really out of place although I prefer them to the wide leg ones she wore a few weeks ago. An ankle boot with a slightly longer leg may have made all the difference. It will be interesting to see how her style changes over the next year and especially after the wedding. I know this is about Meghan and not Harry but maybe there should be a blog about his style. He looks great. Lauri, I am also noticing Harry’s improved fashion sense- which I believe coordinates well with Meghan’s style. I don’t think the couple look too matchy- the visual is appealing to me. I agree with the commentator in this thread who recommended that Meghan style her hair differently, an issue that I notice with Duchess Kate. I don’t mean to compare but a critique of any public figure for me would notice the distraction, especially when there is a lot of activity involved in a function. Meghan ‘s hair looked lovely at her UN speech. I wish she would consider this look. I also like her hair with a side part. Perhaps pulled back into a low ponytail or a half up knot style, which would be very chic yet practical. She looks beautiful! It will be interesting to see if/how her style will change after the wedding when she is officially royal. I remember Kate's dresses became more tailored and a bit longer, to cover her knees. I'd say that we see Kate's knees quite often. They are adorable once more,natural,smiling,they love the royal job! They have both a "charisma"! Despite the cold and wet conditions some in the crowds were eagerly awaiting the arrival of the couple!!! Liking the use of All Saints high street brand (a brand I like myself) it's a good fit, fashion wise, for her being a little edgy and relaxed. Look forward to seeing more as the day unfolds. This jacket looks like a bathrobe. I can’t understand why Meghan is celebrated for her fashion when none of her clothes seem to fit her! I’m glad she is such a kind and caring person, that will be my focus in following her. This is the best thing about fashion, the different opinions! I kinda disagree here, I think Meghan's clothes fit her just fine but her coats can tend to be a bit big on her. Meghan loves a bathrobe style coat the way Kate loves a Breton-stripe shirt. It's just her thing. Meghan loves a bathrobe-style coat like Kate loves a Breton-stripe shirt or a lace cocktail dress. People like what they like. That "bathrobe" styling is right on trend. In Tokyo you see almost nothing else in all manner of fabrics from refined cashmere to something resembling shag carpets and bath mats. I believe it's something you are either fond of or not. MAM Blog Stylists sofy and Mr. D, UK were close in their suggestion for Meghan. The idea of contrast edge / border on a coat was suggested with this smart coat by Mr. D.
sofy suggested this beautiful white sweater. Princesses - just like US! One pic shows she forgot to remove the basting stitches holding the coat’s back vent in place! Otherwise, perfection. I love the cropped pant and high heel. Very chic and modern. She looks amazing as always. What a gorgeous looking couple! Love both of their looks today. Another handbag to drool over and covet ;) Love the collar on her top, excited to see the whole thing if/when she takes the coat off. I love this look on Meghan! One of my favorites so far! FYI looking at Jessica's social media it doesn't appear she was in London last week at all. She was working and posting quite a bit. I think the friends were likely her Northwestern besties Lindsay who lives their part time and Heather who did actually fly out there per her social media. Two fellow Meghan bloggers saw Jessica comment she was in London this week. I'm not active on Instagram, but perhaps it was a flying visit? Maybe! Just was looking at her IG page and didn't see any comments about London but I could very well be wrong. Haha. Not that it really matters anyways. I know that coat is awesome, give me, give me, Lol! She knows her style, she looks lovely and Harry is ever the gentleman! The basic elements are no longer surprises, and I really like the coat a lot. And it's not $1000s, which is a nice change. The white top looks terrific on her---so much white! Interesting that she is so minimalist with her jewelry---she never seems to wear a necklace, although I suppose it is better without one for this top. While Abigail Spencer has worked with plenty of talented people, good friend and former Suits costar Meghan Markle has always stood out. I love how she looks today, really stylish and looks very professional. I am looking forward to seeing her at the Commonwealth event in April, as we might see her in a dress/gown. There is only so much you can do with coats and trousers. What a lovely thing Harry and Meghan did for that girl. The joy in her face!! She will remember this, for sure. Also very nice to see support for women's day, although if I'm honest I would say hacking is hacking and one person's truth is another person's lie. Bit i should read more about what they do before i come down on it! Looking forward to reading when I have more time. But the handbag game is strong with this one. 🌸 That it is bluhare. Let’s hope she starts incorporating new styles/silhouettes though. As super as her purses are so far, they are all starting to look like the same basic style, yeh? Bluhare, I thought the same thing!! Great, you can change a negative comment into a positive one. But just as easily, someone can hack your info and change everything positive into something negative. 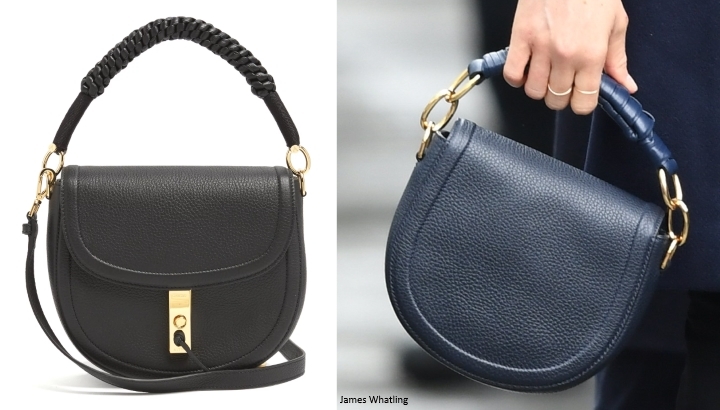 The current purses Meghan is carrying are absolutely on trend at the moment if you can afford them. And, they sure do impress over the clutch! 🌸 USA Granny. :) They are even beyond trend, in my opinion. They are classic. Town and country classic and I love them. She is accumulating a lot of very similar ones, that’s all. I wonder if we’ll ever see any repeats on any of her stuff. What do you think? bluehare, not sure I’m folllowing your comments; but I interpret that you and I might agree that Charlotte’s blog maintains an apolitical site. I enjoy the fashion, historical content, and overall knowledge about an event. Beyond that, I’m not interested in commenting on issues that may have political implications, including the purpose of today’s event. Comparisons regarding a former US president and his spouse are not relevant; but Queen Letitza’s interaction with King Felipe, and other royalty that may be a topic in this blog, and are the focus of Charlotte’s wonderful work, are significant to my selected reading, and humble commentary which I hope stays on subject. I must say again, that Meghan’s handbag collection is so beautiful. And I do see Meghan’s fashion sense similar to Letizia; which is a compliment to both ladies, in my humble opinion. I also love that quote from the STEM person - 'you can't be what you don't see'; how seeing an influential woman engage seriously with things beyond the expected realms of female existence is extremely powerful for shaping what is possible and normal. I think that is the thing I am most hopeful about with Meghan and Harry. That they enthusiastically demonstrate equality and diversity in their work, so those things become more normal. Meghan has been heavily criticised for being 'outspoken' / vocal on all sorts of social issues. As far as I can see, it's a lovely thing to see a strong woman vocalise her opinions, because we haven't seen enough of it to make it normal. Especially within the BRF. Please, more. Also, English rose - I think there's gonna be lots of talk about things on here that you probably deem 'political'. I would say that everything in life is political. As the root of that very word means the people/the community, and all that shapes us. While I love fashion chats, I also get bored as hell when a public figure is reduced to just the stuff they wear. And her handbag game is AMAZING. I do love altuzarra. Leafy!! Nice to see you here. It's been a long time. Now we just need curiousKat to poke her head in. Hi English Rose, we do agree. Charlotte shouldn't get in the political business and I think she avoids it. Maybe where we don't agree is I don't think international women's day is a political event. I think it's more of a grassroots acknowledgment of what women have accomplished, and encouraging them to follow their dreams even if those dreams are to be a stay at home mother. Encouraging girls to follow STEM curriculum isn't political either; I think too long women have not been encouraged to explore science and math -- I was one of them -- and I do regret not pursuing them now I realize my dream of being a quantum physicist doing research on the origin of the universe is not going to pan out. If I had the math background I might be taken seriously instead of having people think I've had some of Grandma bluhare's herbal brownies. As to the hacking, I agree Katie CH. I understand why, but I'm not sure I agree with the method. I really like her ensemble today! Thé slouchy sweater, the sharp ankle pants, the feminine heels, I think it all work together perfectly. So great to see them working and doing an engagement forcused on girls and STEM. I feel like it fits really well for Meghan in terms of supporting women and equality. More girls need to be encouraged in STEM. Overall she looked great. I love the sweater and the cropped pants with heels. Very trendy and stylish, yet still very classic and polished. Also all very accessible for the average person. Do you think she wears pants and bags with handles to distinguish herself from Kate? She does have her own style though and is, of course, actually older. She's got the best legs I've ever seen so anything that shows them off goes a long way. I love her wrap coats/skinny bottoms look. Hi Amy, interesting thought but I don't think Meghan wears pants or carries handbags to distinguish herself from Kate. I have two different ideas about this 1) Meghan has long worn pants and carried handbags privately and professionally and is just continuing that, 2)perhaps she is settling into a "work uniform", a look that can carry her through many different types of engagements. It is also possible that once warmer weather comes, she'll start wearing dress/skirts but now is just trying to stay warm. I think she wears them because she has a short torso and it can be difficult to find dresses that suit. With separates she can manage her proportions better. She is beautiful today! Anyway Hope they will let go of the holding hands thing, I don't know why but it doesn't seem professional. Thank you Charlotte as usual. On the other hand, it always strikes me as strange when other members of the royal family barely touch in public. They're in love! Exactly, she is not an insecure woman at all. Let's hold hands for Christmas, trooping the colors etc. Here just be professional and secure for yourself and for Harry too. Frederick and Mary of Denmark often hold hands. Princess Anne never does.The Queen never hugs people but her younger family members do. It is just a matter of different rules for different people. We need a bit of variety and I think the public generally like it. Meghan's top and pants and heels are fantastic. This silhouette works for her. Chic and professional. I think boots would have looked terrible with these pants. A heel or flats are really the only thing that works well for pants like those. I think these pants look infinitely better and far less messy than the wide leg ones. Her coat... it's lovely, but not on her. She really needs to get her coats tailored and lose the tie. It adds a lot of bulk to her small frame. 🌸 Senorita Dee. I agree about the “wrap coats”. One once in a while but as a typical style? Nope. Too much bulk and the belts look obtrusive. They are investment coats so we will probably see them again though. Or will we? Will she recycle her investments by wearing them again? Has she yet? I don’t recall. P.S. I read where Doria, Meghan’s mom, sends her little turtles (not real ones) from time to time to remind her to slow down and that “slow and steady wins the race”. Harry looked so proud of himself when he introduced Meghan to the young girl who wanted to be an actress. He knew it would be a nice moment for the girl but also for Meghan. What a sweet husband he will be!! I also appreciate that given Meghan's career as an actress has been used by so many as a way to diminish her or claim she is unfit here is Harry pridefully bringing a young girl to meet Meghan because she aspires to be an actress. Absolutely Mimi and Anon. What a fantastic and inspirational day for Sophia. 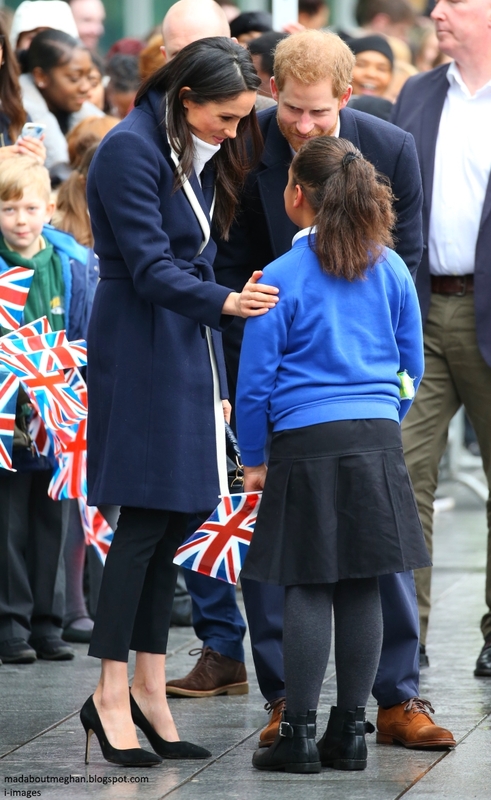 This is what I absolutely love about Harry and Meghan - they are not afraid to let the barriers down and talk to people as though they were close friends instead of complete strangers. This is what Diana did so well too, and Harry has inherited that from her in spades. I am over the moon that he has found someone in Meghan who seems to have a similar approach and that, unlike Diana, Meghan is starting her royal life with someone who clearly adores her. May their little displays of affection and concern, both for each other and for other people, continue unabated. Heaven knows the world is in desperate need of a big dose of love at the moment! Mimi, Anon at 15:24 and Helen H, I agree wholeheartedly. "Heaven knows the world is in desperate need of a big dose of love at the moment!" - beautifully said, Helen, I do so agree!!! Yes Anon, I love how proud Harry is of Meghan's former profession, he looked so proud of himself when he brought the little girl over and was beaming during the interaction. He knows her well. So right about how he sees her profession as a plus. Helen, I love how Meghan has continued to hug people and also hold hands with her husband to be in the face of intense criticism. At first I was worried how Meghan was dealing with it all but now it seems she will continue to be her huggy wuggy self. Bravo to Harry and Meghan. She looks lovely and I like all the items she is wearing. She does like the less fitted tops and coats but I think they look good on her because she is so slim. She would look great in fitted items also. Thought the heels and pants were fantastic. Great to see them interact with people waiting outside.And of course a fantastic opportunity to shine a light on women/girls again.I hope they will progress with that in the future and Meghan can stand out as a role model.Her style is nice and appropriate.Looking forward to see her beautiful hair in an updo.I have long hair and like to wear it open,too.But it also makes me quite nervous and I feel untidy-but Meghan seems comfortable with it and that‘s what counts.I‘ve been wondering why William and Kate didn‘t attend the baptism and the dinner afterwards-and ideas? ???? I'm confused, what baptism and dinner didn't William and Kate attend…and what does that have to do with this post about Meghan? Sorry, Anna, since I posted above, I've read that there was a baptism and confirmation for Meghan into the Church of England (Anglican) and that Charles and Camilla held a dinner afterwards. Not sure why William and Kate weren't there. I don't think it would have been an intentional snub. Perhaps they had a private commitment, or perhaps Kate just needed some quiet time. Great to see them interact with people waiting outside.And of course a fantastic opportunity to shine a light on women/girls again.I hope they will progress with that in the future and Meghan can stand out as a role model.Her style is nice and appropriate.Looking forward to see her beautiful hair in an updo.I have long hair and like to wear it open,too.But it also makes me quite nervous and I feel untidy-but Meghan seems comfortable with it and that‘s what counts.I‘ve been wondering why William and Kate didn‘t attend the baptism and the dinner afterwards-any ideas? Becca USA, that last image of MM in this post is what I think her wedding dress may look like, although I don't think it will be as simple. I've been reading what I hope is fake news about the dress costing 400,000 pounds. I hope tat is not true! I would think the dress will be on par with Kates dress that was more than 100k. I just find it odd the "source" would know the cost but not the designer of the dress. Also odd that since the dress is not complete how would they know the final cost? 🌸 Love the top photo with Meghan’s hand on Harry’s back. So happy for “our” Harry. :) Not too much clinging, not too little. Just right. :) It is a joy to behold. (even though the “clingy” clinging in the beginning did bother me.) I am so glad it has evened out. Harry is awesome and Meghan is lovely! Wonderful to see Ms Markle at the IWD encouraging young girls to pursue their dreams and in support of STEM. She looked lovely and I would definitely purchase the coat. Thanks, Charlotte. It was very interesting to read about STEM and inspiring to see all those young girls being taught something positive and interacting with each other; GIRL POWER at its finest. As an American - it is very surreal to watch this lovely young woman walk around with Prince Harry. Plus, it is very obvious how in love they are. It will be a lot of fun to watch these two while we wait for Kate to give birth to baby Cambridge #3. I'm not familiar with "Hen parties" - is that the equivalent to our Bachlorette parties in the States? Did Kate do one? LOL Becca, me too! If the pants and shoes had been navy I think I would have been jumping up and down and doing cartwheels today! 🌸 Becca. Helen. That would have been SO much better. I agree. I agree Becca. While the black pants and shoes don't clash, they certainly don't enhance the navy coat and purse. It is not like Meghan can't find or afford these items in navy. Besides the colour, I think the style of the skinny cropped pants and stilettos are out of sync with the coat. To give a better balance, I'd like to see a longer, somewhat wider pant in navy and a navy ankle boots, or at least a navy shoe with a thicker, lower heel. Hmmm. Interesting suggestion. I'm sure that others would find the navy on navy too matchy-matchy. Personally, I've always thought that some women have that je ne sais quoi which allows them to pull off navy with black in a way that is super sophisticated. I think Meghan nailed that today. Looking forward to others' views. Black and blue don't go together since when? You guys never wore blue jeans with a black top or black pants with a blue top? I'm utterly confused. Navy + black = sophistication in my book. I am pretty confused too. Black and blue are like peanut butter and jelly - at least to me. Navy and black is a standard combo that professionals wear all over the world. Men and women alike. I feel like we must inhabit different planets because where I come from, this is so basic that it's what I wear with my eyes closed. I LOVED what she wore today - my favorite too because I have tons of outfits like this that I wear regularly. I am also a skinny pants girl. And of course my wardrobe used to be dominated by JCrew when I was younger - now I venture into other brands more. Still go back to JCrew blazers though. Idk, the idea that she must wear pants and shoes of the same color as her coat seems extremely matchy/matchy to me. Really, who does that? You can wear a coat of a certain color like red, navy, green, but there's no requirement for pants and shoes to be the same color. Becca, I'm with you.... "if you can't say anything nice, don't say anything at all" is ingrained in me as well. I'm fine with a "oh her hair would have worked if it was in a ponytail given the wind." But I'm never looking for either women to change their style based on my taste. I had the same thought, why wouldn't Megan pair it with Navy slacks and heels? It would have just taken it up a notch. Helen, I would have enthusiastically posted my excitement. These are the "early days" and my guess is that she'll start to shift over time. I like the outfit but from the pics it looks like she’s wearing navy, black, white and cream. It’s too many colors for me! In looking back through the photos and video, I agree that the hair covering her face constantly needs to be dealt with. She clearly likes that swoop of hair and she could tuck it behind her ear, it looks like she deliberately likes to have it fall across her face. Speaking as a Canadian, and coming from a cold climate, I've noticed that the coats Meghan wears are standard types of coats we wear in the fall and winter. They are what is often referred to as an overcoat. All of Meghan's coats have been classic in style, and they are coats meant to be worn over your outfit, sometimes sweaters, or suits. They fit her properly. They are meant to look very different from a "fitted coat" which often can only fit over a blouse or dress. Meghan seems to have a penchant for coats with tie belts, which are probably not everyone's cup of tea as they can look bulky or make a coat look like a bathrobe. All that being said, I loved Meghan's look today. I think she was very polished, and very much within her own style. The length of the coat worked well with the cropped trousers with stilettos, and the slim silhouette of the trousers worked well with the sweater shape. I thought she looked wonderful in the navy and white. Thank you, thank you, thank you. We who live in the states wear coats in the exact same manner as you described. The belted looks allow her to better show off her tiny frame. I do not think we will see her belting coats as Kate does unless she is in a wrap coat. Canadian, You are right on point about overcoats. Same here in the upper Midwest. Meghan’s (and mine) definition of a coat is totally different from kate’s definition of a coat. And that’s understandable-different climates and styles. And I’ll add that it is certainly not required to match your pants to your overcoat. I personally would not wear a navy sweater with black pants, but a beautiful navy overcoat can be worn over any color. I personally don’t buy belted coats, one of the reasons being the belt hanging loose down towards the ground, or stuck in the car door if you are wearing the coat open. I am unsure what the difference between a coat and an overcoat is by your definition. Europeans wear coats as well to add a layer of protection when they go outside. Sometimes the coat has to fit over think winter jumpers and sometimes it has to fit over thinner blouses. It depends on the weather but a coat is always something worn over the normal outfit. Kate often wears coatdresses (a very British thing, slightly outdated but for weddings in my opinion- even though I love the look) but those are not coats as Europeans would define it. And the oversized style does not have to mean that a coat looks ill-fitting. I believe we will see a change in Meghan's coat style when oversized isn't the current trend anymore. I just love Megan's style. She knows who she is, what looks good on her, and she pulls it together every single time. I like that she keeps to a capsule wardrobe - knowing her colors she likes and sticking with them. She is always polished looking and very classy. Nothing fussy about her clothes, which I love. This woman has style, and I'm loving watching her blossom as a member of the royal family. She reminds me so much of Diana, who knew her style also, and what worked for her. So far every single outfit she's worn has been a home-run for me. She seems like such a warm person. Thanks for an excellent post! Oh yes Ms. Becky, l could not have written that any better! 🌸 Charlotte. Thanks for all the videos you purchase and include. The videos give an additional perspective for sure. I like the side part Meghan's hair, it's far more flattering. I would have preferred navy pants and navy shoes, but, it's a minor quibble. Thank you Charlotte, not just for today's post re the visit, but the update on Meghan's baptism. It was lovely to read, that Charles and Camilla hosted a dinner for her afterwards. It certainly seems as if everyone in the 'Firm' are doing all they can to make her feel welcome and happy ! Read that the white sweater is sold out. And it is possible, from what I read about the dinner party including 18 people, that Kate and William were there, but I also think they may have been encouraged to not come so Kate could relax. I know that she has a nanny, but going out on a "school night" may have been more than she wanted to do. It is very sweet that Charles has a dinner---I think Harry's family really is being very warm and loving. I don't know if Meghan has much interaction yet with the cousins except at Christmas. Hair is so personal---I think MM and Kate like to have long flowing hair regardless of how and where it flows. I can understand that. Oh, and i thought perhaps the hand holding is Harry being sure she is OK---a security sort of thing. literally wanting to be sure he is there in case anything happens. I'm sending positive thoughts and prayers your way Eve. I can only imagine how incredibly disappointing it is when the people closest to you don't live up to your expectations. Please don't lose hope - trust that the universe is always working to your benefit. Oh Eve, I do hope your situation improves. We feel betrayed when people let us down. Here's wishing you happier days ahead. Eve, I sincerely hope things improve for you! Stay calm and carry on .... take it hour by hour, one day at a time. And know many of us are pulling for you to have brighter days ahead. Eve, I am so sorry! I hope we can all send some collective love your way to help out. Dear Eve, here's wishing you strength and fortitude and calmness to meet every crisis moment. I hope you have better times coming very soon. I'm so sorry you are having such a hard time right now. Thanks SO MUCH, my friends!!! Awwww, you made me cry, I was so moved by all your kind words!!!! You rock!! Oh no, Eve! I hope you pull through this extremely distressing time...I know this blog/DKB & the commenters on them have helped me through some difficult times over the last year or so. Harry & Meghan’s love & compassion is definitely a shining example that there is hope in this (at times) troubling world. Your DKB friends are with you, Eve! Sending you a hug. I looove the shoes and I looove the sweater. I'm a little iffy on whether the sweater is appropriate for royal "work". It looks very loungewear-y. Maybe if she had added a belt or if it were more fitted? Her pants need to be longer. I think she's going for the cropped look make her legs look longer but it's doing the opposite, it's cutting her off. I like the cut of the coat but I don't like the piping. It reminds me of Kate's blue with white piping "nurse" outfit. A little too kitsch for my taste. I think if it were a solid color or the piping were more subtle (a thinner stripe or a darker color) it would work. I also dislike the fabric belt. It adds bulk to her midsection instead of highlighting her waist. A leather belt would work so much better. I give her props for stepping outside her comfort zone with the coat, though! 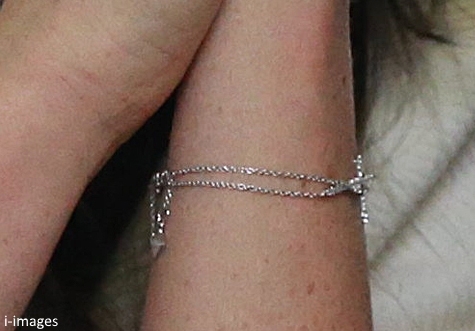 Did anyone identify the new 'cross' bracelet she had on today? Perhaps a Christening/Confirmation gift? Question, how many assistant secretaries does Meghan have? There appears to be two that travel with her that take turns. Is anyone else aware of this? I just saw Meghan's delicate cross bracelet, probably a baptism/confirmation gift. Delicate is the right word for this bracelet, Lauri. I am underwhelmed by Meghan's jewellery. It is so minimal. Not saying she has to wear the Crown Jewels. But there is a happy medium. Her jewellery makes no statement. It is pretty but not at all remarkable. Lol, I am currently loving delicate, minimalist jewelry but I get what you mean. I'm sure trends will change, as they always do, and she'll start wearing larger pieces. One more thing Laura, looking at photos of her before she was outed as Harry's gal, she wore kinda larger pieces of jewelry, multi bracelets, drop earrings etc. I wonder if this move toward the delicate, minimal pieces is trend driven, just a phase she's going through or a desire for a more "royal" look? I know my jewelry boxes (yes plural)are filled with all different types of jewelry, minimal/chunky, yellow gold/silver etc that fit my mood of the day or maybe a trend I'm currently following. Lauri, I think Meghan is working very hard to find her way and be appropriate for her induction into the Royal Family. Back in her red carpet days, she wore bright colours, daring styles and more jewellery. It now seems that she doesn't want to stand out and so is being ultra careful in her style. I hope she stops doing this. It is resulting in her only wearing neutral colours, hardly there jewellery and being so covered up, her clothes are often oversized and drowning her. I really like this coat, it’s my favorite she’s worn so far. The top also looks interesting. But another pair of black pants is really disappointing. There are grey, navy, brown, white, burgundy… trousers she could have worn. I guess Kate has a ‘blue coat museum’ and Meghan will have a ‘black trousers museum’. And a huge NO on the stilettos with Capri pants. Meghan’s lower legs and ankles are not her best feature and this look is not flattering at all, imo. Just love that our happy couple attended an event celebrating women and girls in STEM. I adore seeing the royals support the sciences and educational initiatives! As an aside, I swoon for this entire silhouette. Meghan Markle, you are my style twin. I can't get enough of this outfit! Classic yet modern. Meghan gets it. So excited to see what she brings to the Royal Family. Don't know for sure, but the bracelet looks like a baptism confirmation gift. Have any one'noticed , in the third photo form the top, how much Harry's look and smile are similar to the Queen's ? Bright and intense eyes, real smile, amazing ! Regarding Meghan's outfit, well first I do like seeing her wear pants in official Duties ! Enough with dresses and skirts, let's get easy going and modern ! And I do,like her style,of coats, not bulky at all, they just don't stick to her body like lot of very thin women nowadays, just wanting to show how good they have been at diet and sports ...... I do hope she sticks to clothes she likes, I,am quite impatient to see her at the Comenwealth service, first official duty with the Queen , as sure of herself as she is, I bet she will be "in her little shoes" as we say in French ! Yes, I see that! And he resembles Prince Philip as well. Which is why I always say it surprises me to still see hogwash - comments and jokes - about Prince Charles not being his biological father. It's time lay that ridiculous rumor to rest! Agreed! In fact I find myself at times thinking how much he reminds me of The Tudors! She looks awesome like a model from Vogue as someone mentioned earlier, coat, pants and shoes go together! Now let me see if I can get that sweater for myself! How freaking chic is she?? That white top is amazing and I love her skinny pants and heels. While I don't love navy and black together, I think she pulled it off. I don't know if I forgot that Meghan and Harry were doing this engagement today or if it was last minute, but I was pleasantly surprised to see this post! That little girl will surely remember the moment forever. I agree with those who have said it shines a positive light on Meghan's former career, which I think is a good thing. We're in the modern world, people, women can come from whatever careers they want and also marry into the royal family! At least, in my opinion. I usually don't love the bulk of Meghan's overcoats, but to me, this one is the perfect size and fit. I think she knocked it out of the park today with this whole outfit! Again, her hair doesn't bother me so much. Ok Gang,(OT) remember when I told you all that I come from a CIA Family, Covert in Nature? (a few posts back) well check out the story in The UK about The Father & Daughter who were attacked with a Nerve Agent! It was reported that he actually was working for MI-6! This is what We & our Extended Family lived with. When a Spy Serves His Country.... The Family Serves Too! Everyone's Life is Effected & Constantly at Risk of Being In Danger!!! I wish I could share the names of Recent Movies that many of you likely have seen, that involve members of My Family. Books as well! These stories in Film & Books, These Things Really Happen! These are The People (that we never know) That Serve & Protect Our Countries & Keep Us Safe! Thanks for reading & indulging me! This just really hit close to home! It's why I get hyper sensitive about the dangers Meghan is potentially facing! Oh Becca, I can´t imagine, how that life must be... I´ve stopped reading or watching books/films about this as it seriously upsets me... I can feel the constant danger, the contant wariness (who´s friend, who´s foe?) as if I was going through it myself... I don´t know how the family can deal with this, especially children... I mean they didn´t choose this life, right? Please keep safe!! I can hardly contain my excitement! What a lovely engagement. I love how they take the time on these walkabouts to meet people and ask for their names. More importantly, how neat to read of Meghan's baptism. This week must be so special for her. What a powerful and joyous moment that must have been for Harry, to have Meghan share that powerful relationship with Christ. Sweet of the Prince of Wales and Duchess to support her during that time. I bet that baptism bracelet was a present of one of them to her. Linda/Laurie---I also wonder if it's a confirmation gift. Perhaps from Jessica or Harry or Charles/Camilla or Kate/Will or her mom? Wish we knew!!! 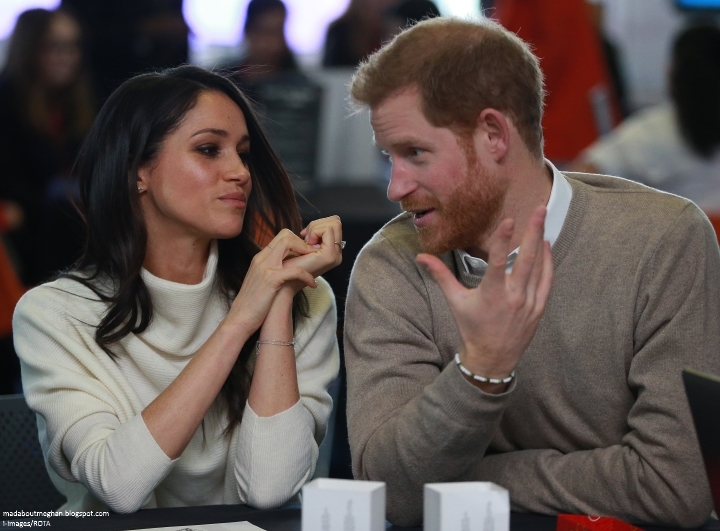 They are so cute together---I think both Harry and Meghan wanted to love someone at this point in their life and they found the perfect partner. Harry has never had someone who was willing, even eager, to face the public with him and he seems to be loving it. I think it was a perfect match---I don't think she would have been interested if Harry was just a guy who worked in a shoe store and I don't think he would have been interested if she weren't so incredibly pretty! Their personalities are both exceptional, so they had much more to appreciate beyond the first glance. It's just a great year---their wonderful romance, which went from rumors to full-blown wonderfulness; Kate's baby; Zara's baby; Eugenie's wedding; and then the new details for Harry/Meghan like a home in the country, kids, etc. And perhaps even dresses!!!! Hi Allison, I'll go with either Harry or Charles. Harry because it's from Birks and he knows she loves that store but I'm leaning more toward Charles because 1)it's in white gold/silver and Harry knows she prefers yellow gold; 2) Charles is known for giving great pieces of jewelry as gifts. But as I'm thinking about it, it might be from Camilla which would be nice as she gave Kate that gold charm bracelet. 🌸 I agree, Allison. I think she thinks they are some of her best features. Funny how we perceive ourselves sometimes. Women who think they have big hips, often don’t, etc. And, ya know, I was just thinking about celebrity influences. Wouldn’t it be nice if young girls were taught to dress like themselves and not someone else. I think that would be a very beneficial initiative to support. Have workshops helping girls develop their own style. Shop their own closets, learn how to sew, shop sales, shop strategically, etc. Learn about body types and how to dress them. Learn fit and proportion, fabrics, etc. How many young girls who would aspire to look like Meghan can afford to spend $4,000 to $12,000 per outfit? How many adult women can? I think Meghan would excel at working within an initiative like that to help young girls become more self-actuated in those things, yeh? I agree with Megan here! I love her long calves and skinny ankles. Haha everyone wants what they don’t have. She thinks about her clothes and has fun with them - can’t wait to see how this all plays out as her budget and engagements grow. I do wish people would stop using the phrase "Fab Four" in reference to WHCM. It was what the US gold medal gymnastics team was called and every time I read Fab Four I think of the reported abuse many of the Olympic gymnasts suffered from their trusted physician. There must be another name for them. Well, back in the day, The Beatles were also called the "Fab Four." Unless someone copyrights the phrase to prevent others from using it, it will likely refer often to any group of four accomplished people. Its what the Beatles are called and that was decades before the US gymnastics. Actually, I meant the "Fab Five"--from gold medal 2012 Olympics fame. Several of whom have supported Ali's claims of abuse by the team physician. I still think the nicknames sound a little too close. I think whichever reporter coined the phrase did it off the top of his/her head without thinking. Still--why even copy a nickname for another famous British group? They each deserve their own name and since the Beatles had it first.... There has to be some other catchy, convenient phrase to identify them. I hate the "Fab Four" thingy too. Do you think Royal Quartet would work? Wecy--I think the draw is the alliteration. Also, I think the nickname got started as a convenience--much easier than saying William, Catherine, Harry, and Meghan. I think it sounded catchy and familiar for some reason-the reason being the nickname was already taken and had been made a household buzz-word a generation or two ago. The gymnastic group nickname "Fab Five" likely played off the Beetle's popular nickname as well. I was just so devastated by the horror of not only what those children endured but also the fact that it went on so long and had to have been covered up at some point. And that they had to deal with it privately and continue to put on a brave face to perform in the Olympics. If they had revealed the situation it would have destroyed something they and their families and a lot of others had invested a great deal of time and money into. That is one reason it went on so long. That fact horrifies me. I and everybody else watched their performances not knowing. I guess I over-reacted to hearing a similar name being applied to the young royals. Becca, I thought that too when I saw that picture! Given Meghan is already in her late-ish 30s, I can't imagine it will be too long after the wedding before they start trying for a family, so next year might just be another exciting one for us. What a great time to be a royal watcher! Love that Meghan haven’t switched up her style much because regardless people will find something to complain about. It’s nice that they show PDA hope they continue doing things their own way. Compared to previous generations of royals who really acted like robots to me. 🌸 I think Meghan’s shooting star earrings, with three stars in a row on each ear, will become a favorite of hers, especially after Harry said he felt “the stars were all aligned” for his meeting Meghan. Another event that I loved. I love this look. It's very business casual and she comes across as serious about the work and also approachable with the cozy sweater. Working women all over the world know that cozy sweaters are an absolute must. When it's cold you can wear them and still be abiding by pretty much every office dress code imaginable. I don't think Meghan's self-consciously trying to be Not Kate with her clothing choices. I just think the two women have very different life experiences and their clothing choices reflect that. Meghan was an actress and despite the #metoo movement the culture of female actresses being the subject of crude, inappropriate, and demeaning comments and advances is still very much present. Many actresses seem to view getting dolled up for awards shows as a "job" and in their normal, non-acting life they prefer not to dress very girly. Kate on the other hand seems to always want to look the part of a princess, Princess Bride ringlets and all. There's nothing wrong with either approach. I think if anything as Meghan becomes a full time royal her style will probably be more like Sophie's. Sophie has occasions when she sort of has to wear the royal "uniform" of a frilly dress and fascinator hat and all that but she's kept her uniquely casual/quirky style. Iy would be great if she started wearing lower heels and flats sometimes. It seems like she did pretty engagement. While I support a capsule-like wardrobe that can, and hopefully will, be mix and matched, I'd love to see more variation in color. Neutrals other than black like navy, grey, beige, tan, brown, taupe, and some real (but simple and not overly saturated) colors too. Maybe a check print and/or stripes. And texture! These are things that can make a simple wardrobe interesting and give the eye something to focus on. I do like her minimalist jewelry though. It's my style. The silhouette of her sweater and pants is stunning. A beautiful update on a classic look. This look is a home fun for me and I’d definitely be plunking down for that sweater if it was still in stock in white. I am finding it really refreshing to have some levity and modernity brought to royal engagements. It’s fun to sometimes see something I might actually buy and wear when I check in on a royal engagement and Meghan is giving me serious inspiration (and girl power vibes). That was a lovely engagement indeed. I think it is a clever move to already build a portfolio for Meghan's future main focus. Still hope she will add other directions as well. Female empowerment is the hot topic right now, but I wish she would also select some other projects that need the puplicity her patronage can give them. Of course she will only take on patronages after the wedding, so I will wait and see what is going to happen. I love her outfit, sans the coat and the handbag. The coat itself is fine and I look forward to see it styled differently. It is the best fit from all her wide coats but in my eyes it clashes with the black and the rest of the outfit stylewise. Black and navy blue is a colour combination that really hurts my eyes. Those little handbags will never find a way in my heart though. They aren't as elegant as a clutch (but don't necessarily hold more space) or a classic handbag style (think Hermes Kelly Bag). They always look clumsy. Still the favourite look from all her public engagemnts since they are engaged. I liked what Dr Ann Marie said about Ms Markle supporting girls involvement with STEM. People purchase what Ms Markle wears; when they see her doing technical things (STEM) maybe that will also be a source of encouragement for the girls. Dr Ann Marie said, “try a different kind of fashion”. Certainly, ‘fashion’ has it distinct place in our lives, but after you’ve covered the body, don’t forget about the MIND; my personal opinion. Thanks again, Charlotte. Eve, so sorry you have had a disappointing day. Life can be like that, but things will get better. Just like this blog has lifted your spirit, I hope words of encouragement from me and others will do the same for you. Take that LEMON and make LEMONADE!!! Thanks again, Charlotte. As far as I'm concerned, as long as Meghan continues to ditch the too-messy "messy bun", she can do no wrong. Everything she wears looks great. Also, we have to be more considerate when critiquing her hair - me included - because I believe she must have had treatments or uses something to relax it. If you compare to photos of her when she was younger, it was curlier. I would imagine this would cause her hair to not necessarily "behave" the way naturally straight hair would. Perhaps the reason why strands tend to separate. I would love to see her embrace her natural hair. I would love to see Kate do that as well. Her natural curls are gorgeous and the only time you see them are in past photos when she was young or in candid photos of her now when she's "off duty." The whole hair conversation bothers me, because of where it goes. Not saying anyone else shouldn't express their feelings, but for me her hair is a non starter. Just had to get that off of my chest. I think the issue is probably just that that bit closest to her face needs to be a bit longer so it stays tucked behind her ear. I just had a thought. There has been speculation that Jessica Mulroney, Meghan's friend, was present and acted as Meghan's sponsor for her baptism. Sponsors acts for an adult, like godparents would act for a child, during baptism. I doubt that Jessica would be a sponsor for Meghan's baptism and confirmation into the Church of England (Anglican.). Jessica is Jewish and she married Brian Mulroney, who is Catholic. So I am not sure what religion Jessica practises, but it is most likely not Anglican. Although modern day rules have become more flexible, generally speaking, it was preferred that a godparent/sponsor be confirmed themselves in the Church of England. Excellent points Laura I am sure you are correct. It is possible that even Charles or Camilla or another family ember acted as a sponsor. I do not remember if you need on or two sponsors. I very much like the coat with the cowl neck sweater. The sweater itself seems much too large for Meghan. The trousers should be navy, and the heels a bit lower. I am glad Meghan was able to mark International Women’s Day with a very appropriate appearance. Remember the Load More button at the bottom of the page if the number of comments reaches 200! 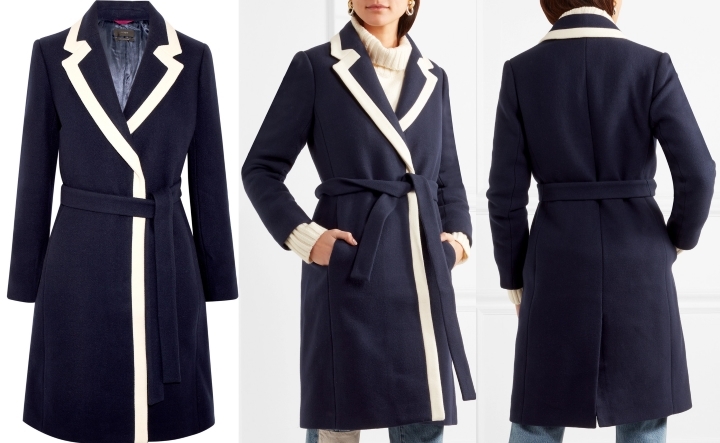 Charlotte, I wanted to mention that if anyone loves the look of Meghan's coat, J Crew currently has a belted shirtdress with a very similar design (navy with white border). Unfortunately it's backordered right now but it's a beautiful piece! We all have different definitions of what is professional. I don't think stilletto heels are. Especially for a day event with children. Just doesn't scream "role model" to me. And it doesn't look comfortable. him with Meghan it makes my heart happy because I feel he is happy and proud of his bride. He did not marry me, the girl who crushed on him a long time but he married someone with black ancestry so Harry and I could have been possible after all, Lol! But seriously I am happy for Harry for finding love because from my experience it's not easy to find love. Just to let you know I am happily married now for almost 2 years now and my husband and I are planning on watching the Royal Wedding together! Her look was spot on and I think the modern cuts of all her clothing is the secret to how you can make neutrals exciting. I love her look and am trending towards her style myself-such elegance and sophistication is the best explanation I can think of. I think she has very much “come in to her own” as a woman where I think Kate hasn’t quite gotten there yet. I think Kate is still exploring her tastes and I think when George is about 10 we will see Kate blossom. I think Kate is trying very hard to find her style but it’s something that has to naturally happen, I actually believe she needs to stop listening to her stylist and have enough confidence to make her own choices. I think she and Meghan really need each other- Kate to guide her through the maze of English society and Meghan offers Kate a dose of confidence! The first pic--looks like Harry's hand is reaching for Meghan's. Very sweet!